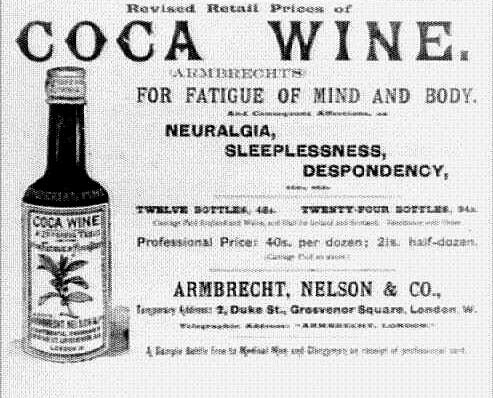 "...sustains and refreshes both the body and brain....It may be taken at any time with perfect safety...it has been effectually proven that in the same space of time more than double the amount of work could be undergone when Peruvian Wine of Coca was used, and positively no fatigue experienced....."
Some 99% of contemporary Western users mix cocaine and ethyl alcohol. Cocaine and alcohol combine to form another hugely reinforcing compound, cocaethlyene. Coca-use only really took off in the West when it was blended with an alcoholic beverage. The real soaraway success in Europe was Vin Mariani. Launched in 1863, it was an extremely palatable coca wine developed by the Corsican entrepreneur, Angelo Mariani (1838-1914). Mariani first tried his new tonic on a depressed actress. The results were spectacular. She soon told all her friends. Mariani himself wrote a book eulogising coca; and he gathered artefacts of, and material on, the coca-loving Incas. At home, he collected coke-taking paraphernalia. He also took up amateur horticulture and cultivated the coca plant in his garden. Coca wine made Mariani famous. Vin Mariani rapidly became the world's most popular prescription. Writers loved it. Anatole France, Henrik Ibsen, Émile Zola, Jules Verne, Alexander Dumas, Robert Louis Stephenson, Sir Arthur Conan Doyle, and other literary luminaries all indulged freely. Composers such as Massenet, Gounod and Fauré gratefully honoured the Corsican druggist in their music. Vin Mariani was celebrated by royalty as well: by Queen Victoria; King George 1 of Greece; King Alphonse XIII of Spain; the Shah of Persia; and by William McKinley, President of the United States. A devotion to Vin Mariani transcended petty differences of religious dogma. The Grand Rabbi of France, Zadoc Kahn, was moved to exclaim: "My conversion is complete. Praise be to Mariani's wine!" Pope Pius X was an enthusiast, as was Pope Leo XIII. He gave coca wine an official seal of approval by awarding Angelo Mariani a special gold medal. In recent years, however, the Vatican has felt unable to reiterate its original endorsement. John Pemberton (1832-1888), the Atlanta-born creator of Coca Cola, was a keen pharmacist and coca-lover. He sought to combine the ultimate medicine and perfect drink in one glorious cocktail. Pemberton based his original drink on Vin Mariani. It was said to be "a most wonderful invigorator of the sexual organs". "Pemberton's French wine coca" proved singularly popular with American consumers. Coke was soon touted as "an intellectual beverage"; though not on the basis of controlled clinical trials. Atlanta introduced Prohibition in 1886. So Pemberton had to replace the wine in his recipe with sugar syrup. Thus 'Pemberton's French wine cola' became 'Coca-Cola: the temperance drink'. Official approval of coca-based tonics began to wane towards the end of the century. Unfortunately, people who were prescribed cocaine to combat morphine dependence were becoming addicted to both. In 1904, America's gathering moral panic about Drug Abuse led the manufacturers to remove the cocaine from Coca-Cola. It is now official Coca-Cola Company policy to deny the existence of cocaine in their orginal world-winning formula. The US Government later tried to compel the company to drop the name 'Coca-Cola' too. After protracted legal argument, the name was saved; but traditionalists claimed the drink itself never quite recaptured its original glory.